After four long years of ink, sweat and tears I graduated from MacEwan’s Professional Writing (PROW). With graduating came a sense of finality, that this chapter in my life is officially closed now. I cannot write enough about PROW. As a program, it was unique. Because it was an applied degree, many of our classes were project-based. Sometimes they involved actual organizations too, such as when we had to partner with a non-profit organization (my group got Kids Kottage) or when we had to present our re-branding of K-Days to actual Northlands representatives. But what made PROW truly unique was the people. The PROWlers. First thing to know is that we were very few. Maybe no more than forty students—less so when we were told that PROW was being cancelled and a shiny new Bachelor of Communication program would take its place. Some of us jumped ship. It was an honour writing, reading and learning with many of my peers—my friends. I remember in our first year many of us were isolated in our own private bubbles. I don’t think there was a single one of us who had a definite idea of what they were actually doing here. I was one of them. I took the program because I loved to write; I had no idea of what kind of job I would have at the end of it. Yet we carried on, learning more about ourselves and each other throughout the years. By the time we were finished, I was part of a network of some of the most talented people I’ve ever met. The common joke between us was that the first thing people say when you tell them you are in Professional Writing is “Oh, like journalism, right?” No. It’s not like journalism. PROW was really about communication. It was about learning how to send a message through a variety of media. In addition to creative writing, non-fiction, short story, poetry, and various other writing styles, we also learned Photoshop, web design, internet writing, business communication, leadership skills, public speaking, screenwriting, rhetoric, magazine writing, media relations and a plethora of other skills. And some journalism was thrown in there too. In a short time, many of us have accomplished amazing feats. 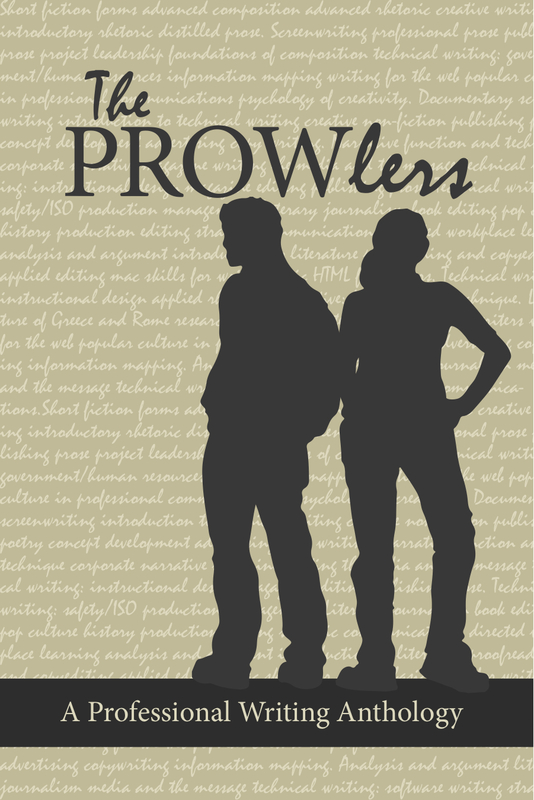 Collectively, we published a book: The PROWlers: A Professional Writing Anthology, a fitting swan song to a program dedicated to the written word. Some have become editors at magazines like Avenue or technical writers for various companies. Some have gone the freelance route. Some write for businesses, non-profits or for government. Some have started their own businesses. Another has completed her own web series. One of us has even started her own publishing company. Pretty much all of us are working on our own books (and one of us has even published his book of poetry—the first PROWler to publish a solo book). As I sat with my fellow graduates, I felt as though this would be the last time we were all together. We all crossed the stage and received our well-earned degrees, then gathered for a group picture and then dispersed. Four years brought together for a single moment, frozen in time, and then scattered abroad. The original title for this entry was “Graduates with extinction”. I thought it was clever, because it rhymed with “distinction” and was fitting since our program is being laid to rest. But this is not meant to be a eulogy. Rather, we leave PROW behind, and move forward with the tools we learned to make a change in the world. And so to all the PROWlers reading this, I say thank you. Thank you for your words, for your friendship and for your support. Thank you for accepting me for who I am—a Canadian Muslim convert with a knack for LEGO and videogames, and a tendency to over-analyze everything. Through your acceptance and your friendship, I gained confidence in my writing and in myself. To me you are all distinct. As writers your skills are broad and diverse. As colleagues you are diligent and creative. As friends you are supportive and always willing to lend a hand or a pen. Together, we were bottled lightning. We were PROWlers. Some of us may never meet in person again—and I hope I am wrong in this. But even still, know that each and every one of you have touched my life and my heart. We are all part of each others’ lives now. Whatever path your life takes, keep a pen in your hand, humor in your heart and imagination in your mind. Write on, friends, write on. Due to Dad’s coal-black hair and handsome looks, one of my friends asked me, in all his childhood-seriousness, “Is your Dad James Bond?” To me, he may as well have been.